It’s been too busy for me to finish up a new project or the March Pattern (it’s coming, I promise) so it’s time for another book review! 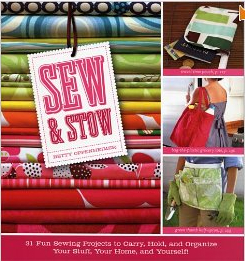 This review is for “Sew and Stow” by Betty Oppenheimer (Storey Publishing, 2008). This book features 31 projects to “carry, hold, organize your stuff, your home, and yourself” including a grocery tote, shoe hideway, cleaning caddy, and gardening apron. The projects themselves are geared towards confident beginners and intermediate sewers and most can be completed in the same day. The author takes a very technical approach to sewing and the first two chapters go in depth on how to select the correct equipment, fabric, and tools, and then discusses techniques for cutting, sewing and finishing. She gives details on the different elements to consider when selecting fabric including water resistance, durability, hand, and weave. There are also tables that organize fabrics by weight and weave which are very useful when selecting the perfect fabric for your project. In the techniques chapter she provides some specific ways to transfer patterns, layout the pattern pieces (you want to make sure the nap is going the correct way), and different stitching types. Information is also presented on other techniques such as making casings, making gathers, forming pleats, creating bias binding tape, mitering corners, and so on. Everything is clearly explained with detailed directions and diagrams. You can learn a lot about sewing from reading these first two chapters alone. The projects are all very useful and she has some great ideas for how to customize them. Sidebars offer more hints and tips so your projects turn out right the first time (for example, positioning a zipper pull on a continuous zipper so it functions correctly in both directions). The projects are also clearly explained with directions and diagrams, and each one has a color photo. The last chapter of the book is my favorite, called “Stow it Your Way,” because it discusses how to design your own pieces. In this section she walks you through the process of creating a customized sewing caddy, file box, and some other projects. These projects don’t include formal patterns, but the author provides enough design information for a confident sewer create some quality customized projects. As someone interested in creating patterns, I found the techniques discussed in this section to be very valuable. I think the main shortcoming of the book is that some of the projects featured on the cover (the sewing caddy) don’t actually have a pattern in the book. Instead, they are discussed in the last chapter and the reader has to design this – including calculating the cutting dimensions for each pattern piece, figuring out how many pockets to include, and in what order to sew the pieces. This is actually pretty easy to do if you read the first two chapters and the design chapters (and reading through some of the other projects that have patterns won’t hurt either), and it gives you more freedom to create the project exactly as you want. However, some people might be disappointed when they realize that the sewing caddy, dog bed, bedroll, and file box don’t include a full pattern. Overall, this is one book I am happy to have in my library. The technical information and diagrams are well worth it to me and I enjoy the challenge of designing my own projects. This entry was posted in Books, Sewing. Bookmark the permalink.